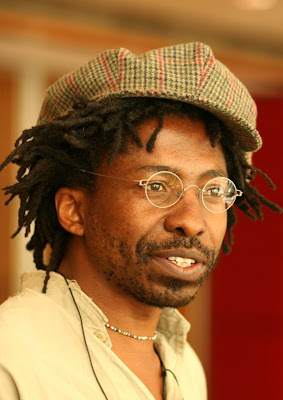 Brian Chikwava’s Harare North is one of the most talked-about African novels of the year. We caught up with Brian in London just after this year’s Hay festival in June. In this 30 minute interview, he talks about the language of his book, the writing process, artistic integrity, his favourite books, the importance of the internet, the location of the writer and the short story as the ideal medium between the poem and the novel. Nice interview. I particularly liked his comment on artistic integrity as the question of how to keep one's artistic integrity intact and write a book that is saleable ( internationally)is one contemporary african wriwters face. Free to write or write to be free?Does one write what one wants to, regardless of its unsaleablity or does one write purely from a commercial point of view? Finding a middle ground is not always very easy, in a market governed (mainly) by the west: the agents that "matter", the publishers that "matter", the readers/buyers that "matter"
Having said that, there seems to be a growing trend to acccuse African writers who choose to (re)expose Africa's ills, the wars, the poverty and so on, of pandering to the West. Africa is the Good, the Bad and the Ugly, and part of a writer's artistic integrity is choosing which reality to fictionalize without feeling he has to justify that choice. Let all the truths be told, and let writers be free to choose which truths they want to tell. Harare North is a beautiful, honest novel. Certainly@Mike. Very true, very true but oh so very difficult, wouldn't you say? Integrity is a fine thing to uphold. I said as much in my earlier post. I have a feeling that you somewhat misread my post. I respect better those artists/writers/musicians who don't try to pretend that they are not interested in making money and thinking that all they care about is their art. This is why i like a writer like Chimamanda. Not because I necessarily like her writing style (I actually don't), but because I read one of her interviews a while ago where she said, when she was writing Half of the Yellow Sun she inserted the character of the white figure because she has eyes on the movie. She understands the Western market and knows that a film about Africa will only have appeal if it had a white face. You might think that is crude, but at least she is honest about her relationship to the market. instead of some of my writer friends who go on and on about how the money doesn't matter but the integrity of their work. Yet, they are the first to complain about how poor their sales is doing and how publishers are trying to shaft them. nice interview. I'll definitely go and get the book. Jeremy, you should do more interviews like this. I enjoyed listening to the Lola Shoneyin's interview. I thoroughly look forward to reading her book.